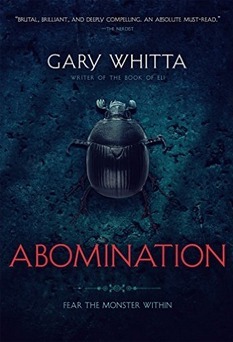 Presenting Abomination by Gary Whittia. She is a fierce young warrior, raised among an elite order of knights. Driven by a dark secret from her past, she defies her controlling father and sets out on a dangerous quest to do what none before her ever have hunt down and kill an abomination, alone. When a chance encounter sets these two against one another, an incredible twist of fate will lead them toward a salvation they never thought possible and prove that the power of love, mercy, and forgiveness can shine a hopeful light even in history s darkest age. Stuff of nightmares this book but nothing short of brilliant for Gary Whitta's 'Abomination'. He was the screenwriter of 'The Book of Eli' and worked with many of the Star Wars and Walking Dead material. So we expected something good but we got something majestic. Clearly mixing history with the horror, Abomination is all darkness and alluring and not all shy of graphic violence and jarring details that comes with the territory. Fiercest of the fierce, warriors of Albert the Great's era, Wulfric paired with a young girl Indra, master of her weapons, but still in need of learning control. Opposites in every way but similarly similar in mysteriously ways. The first, the mightiest warrior of his era but dealt the worst hand of fate when he was cursed to be a malformed, grotesque abomination he so staunchly hunted by orders of his King. Reduced to the life of a beggar to pay for his sins and keep humanity safe from himself. While Indra eager and very very stubborn goes against her controlling father to prove that women can also do what men can. Her mission to kill an Abomination by herself and attain the privilege of being a part of the order. She may be a master swords-woman, with a kind and generous soul but she has much to learn in terms of anger, revenge and the line that holds it all apart. With two such fulfilling characters, Whitta adds layers of mystery, of surprise, the thrill of the unknown and magic, to strengthen the armor, to scry a location but most of all its ragged use that brought those creepy, twitted, scarred monstrosities to behold. The plot is well written and well layered, twisting in on itself and surprising us with revelations at opportune moments. All the while striking fear to our very core with its dark and evil atmosphere and the gross description of said Abominations. Gary Whitta skillfully layers out a narrative that captures our attention from the beginning with its astounding mix of history, of fantasy and turning us squeamish at the horror. With a well written plot Whitta's words take us back to the dark ages and keeps us spell bound and rapt till the end. "A wicked mix of history and the paranormal. Keeps us spellbound till the end"
I don't think I've ever even seen this book before but I love how fantastic and utterly captivating it sounds. Stunning review!